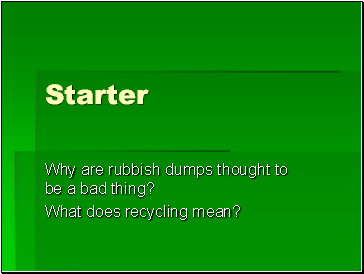 Why are rubbish dumps thought to be a bad thing? 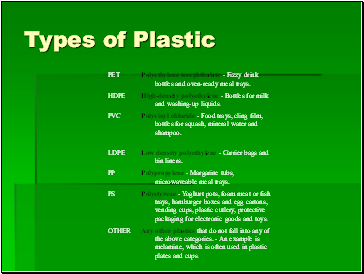 About 7% of all household waste is plastic. 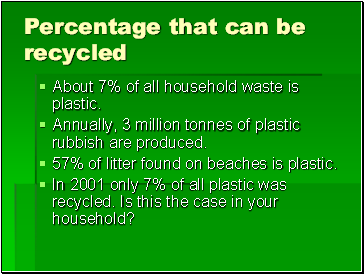 Annually, 3 million tonnes of plastic rubbish are produced. 57% of litter found on beaches is plastic. In 2001 only 7% of all plastic was recycled. Is this the case in your household? 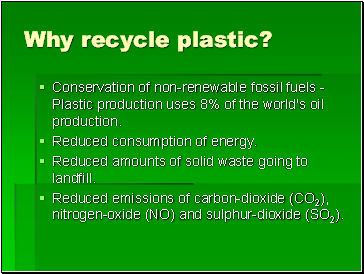 Conservation of non-renewable fossil fuels - Plastic production uses 8% of the world's oil production. Mechanical recycling of plastics refers to processes which involve the melting, shredding or granulation of waste plastics. 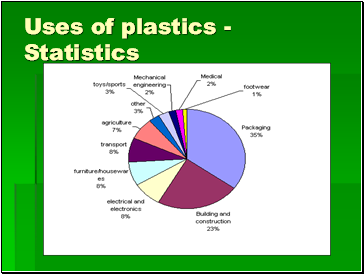 Plastics must be sorted prior to mechanical recycling. 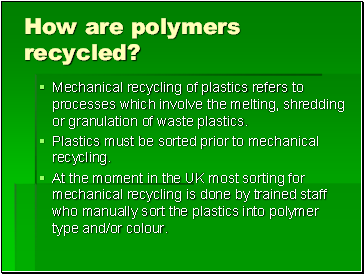 At the moment in the UK most sorting for mechanical recycling is done by trained staff who manually sort the plastics into polymer type and/or colour. 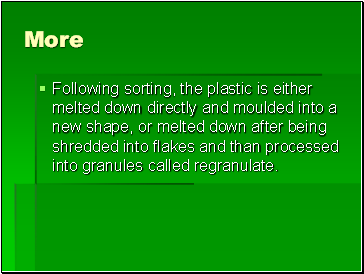 Following sorting, the plastic is either melted down directly and moulded into a new shape, or melted down after being shredded into flakes and than processed into granules called regranulate. An increasing number of local authorities are now providing plastics collection services. Research by RECOUP has shown that local authorities can achieve cost-effective high-achieving plastics collection systems by integrating plastic bottle collection with other recyclable materials. For example, Daventry District Council introduced such a system in 1998 and has been able to increase recycling rates from 12% to nearly 50%. 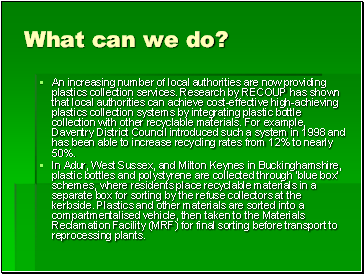 In Adur, West Sussex, and Milton Keynes in Buckinghamshire, plastic bottles and polystyrene are collected through 'blue box' schemes, where residents place recyclable materials in a separate box for sorting by the refuse collectors at the kerbside. Plastics and other materials are sorted into a compartmentalised vehicle, then taken to the Materials Reclamation Facility (MRF) for final sorting before transport to reprocessing plants.